When Blair was asked why Britain had not stuck to the “policy of containment” through the use of sanctions, he also echoed the US justification for war that everything had changed after the 9/11 terror attacks. It was no longer possible to “take risks” that other attacks might be mounted. When it was pointed out that Saddam Hussein was not involved in 9/11 or with al-Qaeda, he countered that “rogue states” could not be allowed to develop WMDs and that the link between Saddam Hussein and al-Qaeda was that repressive and failing states become “porous” and therefore easier for terror groups to infiltrate. Even while formally denying that the war against Iraq was in pursuit of regime change, and that he had agreed to such a war when meeting with President Bush at his Crawford ranch in the spring of 2002, he repeatedly gave tacit support to the US policy of pre-emptive war. The option of removing Saddam had “always been there”, he said. After 9/11, the view was that “we can’t go on like this.” Asked whether the removal of regimes had become a “valid objective” of government policy by 1999, he said it had not. But he added that President Bill Clinton had come out in favour of regime change as early as 1998. Britain too wanted to deal with the threat from WMDs and if this required regime change, then that was what had to happen. “There is a danger of making a binary distinction between regime change and WMD,” he said. Blair’s only attempt to avoid explicitly sanctioning regime change as a policy was to insist that the issue was WMDs and that Iraq it was in defiance of UN Resolution 1441, which he continues to claim gave authority for war to be declared. There were many regimes that he would “like to see the back of,” but there has to be a basis of a security threat to the UK, he said. Not once did he identify any such threat to the UK, without which there was no basis for war. Instead there was the claim against all evidence that Saddam “definitely had” WMDs, or alternatively that he had “believed” it was “beyond doubt” that Iraq had WMDs as he had stated in his notorious foreword to the 2002 intelligence dossier. When it was pointed out that it was proved that Iraq possessed no WMDs and that UN weapons inspectors under Hans Blix had not been allowed to complete their work, Blair again fell back on the question of a “potential”: The Iraq Survey Group, he said, found that Saddam had the means and “know how” to restart a weapons programme and this alone justified war. Sometimes it is important not to ask the “March 2003 question” but the “2010 question,” he said. 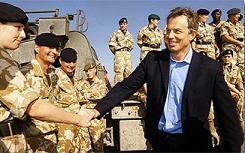 Blair portrays the “2010 question” as being whether the world is “better off without Saddam.” It is far more than that. His argument amounts to a rationale for the major powers, and the US and Britain in particular, launching wars of aggression with the aim of regime-change whenever and wherever they see fit. This was, he said, of continued importance. There are “very similar issues” with Iran as with Iraq under Saddam Hussein, he proclaimed, and Britain was in a “far better placed” to deal with this threat now. Regarding the issue of UN authorisation and the requirement for a second UN resolution, he baldly insisted that Resolution 1441—passed in 2002—gave war legitimacy. But he was forced to acknowledge that the US was always ready to act unilaterally. He too eventually gave up on a second UN resolution because it was “very clear” that France and Russia would not agree to such a resolution, which had “disintegrated” the possibility of securing a majority on the Security Council. This was an admission that Britain had also acted unilaterally because it could not get what it wanted from the UN, which is in contravention of the UN Charter.